Every Sunday morning, I get up at the crack of dawn (and even before dawn in the winter months) to walk about 10 miles with my friends. We are training because every year, about 8 or us do a 60-mile walk for breast cancer. It takes a lot of warm-up walks to make sure you are ready to walk all day for three days straight! Anyway, our tradition has been to get up early on Sunday mornings, because that seems to be the only time that works well for most of us to get together regularly. These Sunday mornings are one of my favorite times of the week, because for 10 miles, I get to laugh, cry, commiserate and celebrate the things that have happened to each of us during the week. We give and get advice from one another, we share stories about our families, and we compare opinions of books, movies, TV shows, current events, etc. We quite often get into the realms of politics and religion. I think that these couple of uninterrupted hours we have together every week have made these friends some of my closest and favorite people. At the end of 10 miles and a very early alarm clock, though, I come home exhausted! And hungry! (I certainly don't wake up any minutes sooner than I have to, in order to do something so banal as eating breakfast). Yesterday was no exception. 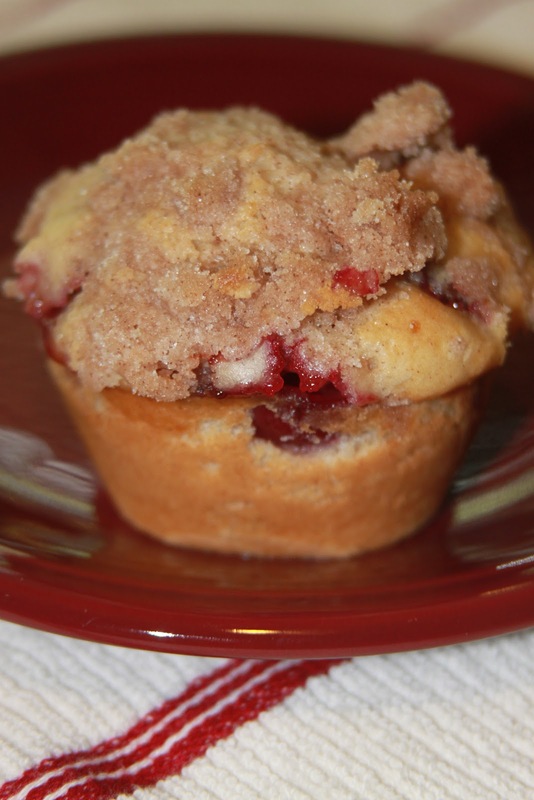 This week, due to having a load of very ripe cherries, I went for a batch of cherry streusel muffins. These are similar to blueberry muffins, but the cherries, due to being a bit heartier, don't break down and "bleed" as much. This makes the muffin nice and white, and the cherries stay juicy and beautifully red. They are very easy to make, and quite delicious! Preheat the oven to 375. Grease the bottom of a muffin pan (12 muffins) or use paper liners. Stir together flour, sugar, cinnamon and salt. Add egg, oil, and milk, and stir until just combined. Gently fold in cherries. For the streusel topping, cut the butter into the sugar, cinnamon and flour, until it resembles coarse sand. Sprinkle this over the muffin batter. Bake for 20-25 minutes, until the muffins are golden brown.